At Aurangabad, Morcha members ransacked several corporate offices, including Siemens, and set at least five vehicles on fire. The Bandh called by the Maratha Kranti Morcha, demanding quota for the community, witnessed sporadic incidents of violence and arson in parts of Maharashtra with Aurangabad in Marathwada region and Pune district among those affected. The bandh, which began on a peaceful note, turned violent later in the day. This was despite Maratha leaders, who are demanding quota in jobs and educational institutes, appealing to their community members to protest peacefully. Around 12 km away from Aurangabad city, a large number of Morcha members targeted the MIDC Waluj area, which houses several corporate offices. The members barged inside the Siemens office and broke glass panes. Employees at work could not move out as the mob vandalised the property. 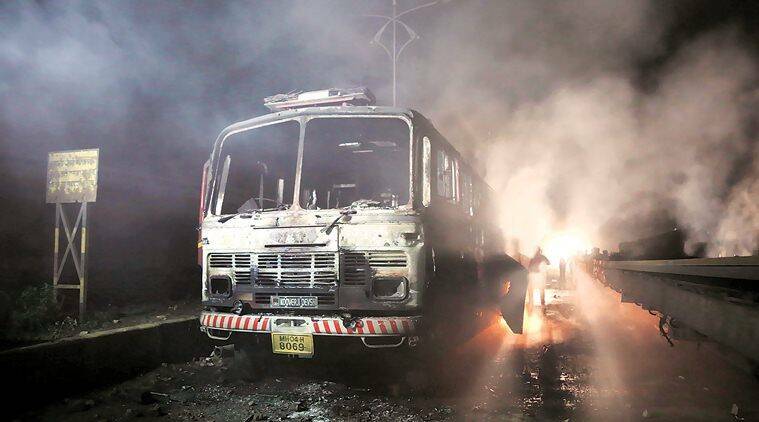 The neighbouring BSNL office was also attacked and the protesters set five vehicles on fire on the main road in MIDC. They also hurled stones at Aurangabad Police Commissioner Chiranjeev Prasad, who rushed to the spot. Police resorted to lathicharge and fired tear gas shells to bring the situation under control. No one was injured, said an officer. A senior Morcha coordinator said, “We had given a bandh call in entire Maharashtra. But several companies in MIDC refused to listen… Our plan was to ensure a peaceful bandh. But those who refused to observe bandh became a target.” He added that companies including Seimens, Shreya and Nylon Pharma were targeted. Earlier in the day, while in urban areas of Aurangabad district, protesters waved flags, raised slogans and took out bike rallies, in rural areas, quota supporters marched on the streets with their farm animals. In the absence of political leaders to spearhead the protests, the bandh in Aurangabad saw small groups of Maratha supporters gather on roads, bridges and city squares. In Pune, a mob vandalised property at the district collectorate and incidents of violence were reported from some other areas, including Kothrud, but there was no loss of life. Internet services were suspended in seven talukas of the district — Baramati, Khed, Shirur, Daund, Maval, Bhor and Junnar. The services were restored later in the evening. At the district collectorate premises, a few protesters damaged lamps, window glasses and the cabin of security officials. Earlier in the day, hundreds of protesters had gathered outside the collectorate to participate in a sit-in agitation. District Collector Naval Kishore Ram said some miscreants went on a rampage after he accepted a written representation from the leaders of the agitation. A group of people barged inside the building and refused to leave. At Chandni Chowk in Kothrud, protesters attacked a police vehicle and pelted policemen with stones. Police resorted to lathicharge and fired teargas shells to bring the situation under control. At least three police personnel were injured. Additional Commissioner of Police Ravindra Sengaonkar said, “Some people were blocking a stretch of the Pune-Bengaluru Highway, between Paud flyover and Chandni Chowk. As we kept clearing the road, they gathered at Chandni Chowk and blocked some roads. When police tried to stop them, they started pelting stones… We had to use force and tear gas canisters to disperse them. At least three policemen have sustained injuries… we have detained over 100 protesters.” A six-year-old girl was also injured by a tear gas canister during the violence. The protesters forced the few shops, hotels, banks and IT companies, which had remained open, to down shutters. The shops and market places opened for business after 6 pm. During a protest in front of the residence of NCP chief Sharad Pawar in Baramati, his nephew and MLA Ajit Pawar joined the protesters and raised slogans with them. Even as Morcha leaders said agitations would continue in the coming days, the protest barely had any impact on Mumbai, with neighbouring Thane and Navi Mumbai remaining completely peaceful. Several establishments remained closed, especially in the morning. The number of buses, taxis and autorickshaws plying on the streets was low, but no incident of violence was reported. A sit-in protest was held outside the office of the Mumbai Suburban Collector in Bandra (East), in which around 1,000 protesters took part. In Hingoli district of Marathwada, the protesters torched a godown of the Panchayat Samiti in Sengaon area, an official said. A toll plaza was vandalised at Manvat in Parbhani district, he added. In Latur, Congress MLA Trimbakrao Bhise faced the ire of Maratha protesters, who surrounded him, police said. Protesters also targeted the former chief minister Ashok Chavan-controlled Satyaprabha newspaper in Nanded. They broke window panes of the office, police said. Protesters halted buses and other vehicles on roads in Latur, Jalna, Solapur and Buldhana districts, an officer said.